Information about how to book guided tours is below, including days and times of operation, contact information, and links to online booking where available. Guided tours available on the hour seven days a week. Call 910-251-3700 to confirm tour times. Guided tours of the house available on the hour Tuesday through Saturday. Special downtown walking tours available by appointment by calling 910-762-0492. Guided tours available on the hour Monday through Saturday. 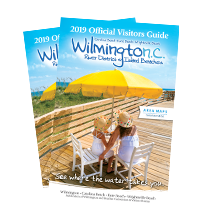 Daily History Walking Tours of Old Wilmington. Call 910-409-4300 for tour times. Call 910-392-6753 to schedule walking tours. Tours available most Saturdays at 1:30 pm. Guided architectural walking tours available on select Saturdays. Call 910-762-2511 for tour dates and to register in advance. Continuous daily tours available April through October. Tours available on weekends only November through March. Private tours available by calling 910-251-8889. Narrated tours available seven days a week. Book now. Guided tours available year round by reservation only. Call 910-251-2572. Tours available nightly March to December; weekends only December to March. Rain or shine. Space is limited. Order tickets online. Tours available daily. Call 910-409-4300 for tour times. Tours available on select nights throughout the year. Rain or shine. Space is limited. Book now. Take a one-hour guided tour through one of the most beautiful and historic theatres in the country. Tours available every Monday at 2:00 p.m. with private tours offered Monday through Friday by appointment. Book now. A variety of tours and special activities available on select days throughout the year. Pre-registration is required. Register online. Behind the Hatch tours are available upon request October through May. A variety of other tours and programs are available year round. Exhibition tours available every Wednesday at 1:30. Guided ship tours available at select times when in port. Call 910-815-4528 for tour information. The Loop Through History and Harbor Island Walking Tour are available at select times throughout the year. A self-guided printout of the Loop Through History tour is available year round at the museum. Tours available on select dates. Also available by appointment. Book now. Ranger-led hikes available every Saturday and Sunday March through October. Other guided tours available at select times throughout the year.